Remember the advice we got growing up on how to take care of cuts–. dab some antibiotic ointment on it, bandage loosely, then leave it open to the air and let it alone to form a scab? Nope. This actually increases scarring. 1. Keep the wound covered with a bandage until it heals. Change the bandage daily. You can let water or soapy water run over it, but don’t aggressively clean it. 2. When replacing the bandage, do cover the wound with a thin film of something like Aquaphor or Vaseline, to keep in moisture. Don’t use antibiotic ointments like Bacitracin and Neosporin. These can cause rashes and reactions. Avoid Target-brand bandages–they all contain antibiotic ointment. 3. Get the least adhesive bandage that will cover the wound and stay in place for a day. Tough and waterproof strips will irritate surrounding skin quickly. Paper tape to hold gauze in place sticks less well, but is far less irritating. 4. Avoid fish oil supplements. They’ve been shown to slow down healing. And, for the record, this is a reminder that tanning beds, which I used often when I was young, are bad for you. Stop pretending they’re not. Real sun, in moderation and with sunscreen, if at all. The end. This is not the story that the title makes it sound like it’s going to be, so don’t dismiss it if you think this is going to be an inspirational story about losing weight. My insurance company discounts rates for things like not smoking, having good cholesterol levels and low blood pressure, getting health screenings, etc. One of the boxes to check is a BMI in the not-overweight range. “Can I take off my clothes and try again?” I asked the nurse. “Sure,” she said, then advised me not only to take off my jeans but also my watch, bracelet and eyeglasses. Down to my underwear, we got a new number, plugged it in, and the new BMI was 24.7%. Success! We both cheered and laughed and clapped. The doctor also found it pretty funny when she came in. Alas, I thought getting the target BMI would get me out of blood tests for cholesterol and glucose. Turns out I have to do those anyway. I’m not a fan of the blood draw; I’ve had some horrific experiences over the years. Also, I’m pretty sure there’s no way to jigger those tests to hit the target retroactively. when Ancel Keys analyzed his study subjects, he concluded that these effects were simply that of human physiology: If you feed someone 1,500 calories a day, his mental health will be jeopardized; he’ll exhibit strange, obsessive behaviors; and he’ll end up fatter than he was before he started. It’s just science. We all know the right things to do: make better food choices (eat more whole, unprocessed foods), exercise more and sit less. Simple, but NOT easy for this coffee/carb/writer gal. 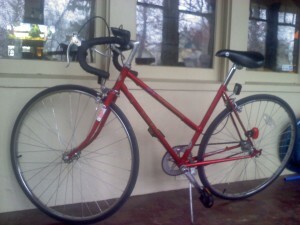 Last weekend I traded in my big yellow Sun Cruiser for a used Schwinn Sprint I’ve named Pepper. I live atop a big hill, and getting a lighter, more wieldy bike made sense now that I’ve established a riding habit. I’m sore from the new saddle, as the old was was wide and cushy, but I will persevere. I am laid up in bed with a spot of pneumonia in my right lung, diagnosed right after I voted on Tuesday. I’ve been resting since then, since I think it’s the result of a cold/cough that I didn’t rest enough for over last weekend, and which seized the opportunity to invade. Since Tuesday, then, pretty much all I’ve done is read, be on the computer, watch TV, and sleep (or rather, TRY to sleep, since the painful lung makes it as hard to find a comfortable position as advanced pregnancy did), and lie abed. I did take a short walk yesterday, in the balmy afternoon. It left me panting and exhausted. Unfortunately, my boys have the next 2 days off school for conferences. Fortunately, so does their babysitter, who is here all day so I can stay abed and she can run them outside. Somewhere after 4yo Guppy was born, I learned that resting and self care were not frivolous indulgences, at least for me, but necessary at times to keep going, both in the short and long term. This lesson took me a long time to learn. As I’ve written before about napping, I didn’t think I was capable of it for a long time, till I practiced. Now I’m queen of the 20-minute snooze. Same thing with resting and taking care; it’s a skill that takes practice. This time, at least, I’m helped by my husband G. Grod, who was able to work from home the past 2 days, and who keeps reminding me that if I don’t rest now, all of us will suffer for it later. I’ve fortified my sickbed well. I’ve got a warm duvet, Euro pillows for back propping, a yoga bolster for knee propping, a lap desk and my computer. Books, comics and magazines to read, throat drops, lavender spray, books to blog about, notebook, journal, tissue box, water bottle, giant mug of ginger tea with honey and baguette slices with butter. I am dressed warmly in comfortable clothes. I have a scarf wrapped around my head to keep my ears warm. I plan only to leave the sickbed for bathroom breaks and lunch, and possibly a little smackerel of something around 3. Here’s what I’m not doing: making phone calls, making lunch for the kids, mediating their fights, keeping them to the usual limit of one hour of screen time/day, catching up on insurance paperwork, doing laundry (even though the boys don’t have clean socks–they’re wearing dirty ones), putting away laundry, straightening, puttering, stressing out. I do have the lurking feeling I should be darning socks, or rather learning to darn socks, then doing so. But I’m gently pushing this aside for now. I’m sick; if I don’t rest I’ll likely get sicker. So might as well rest, since I’m fortunate enough to be able to do so. And since I’ve practiced it enough that I’m actually capable of doing so. Sounds quiet downstairs. I think I’ll sneak down and heat up some soup. Whoa, I am seriously out of the practice of blogging, and intend to get back to it, right now. A busy summer combined with many deadlines for other writing work meant a new routine. I still don’t have the hang of things even though school’s been in a month already, but I’m going to give it a go. On some days, I would probably put sleep ahead of food. I wasn’t always like this. Most of my life I considered myself incapable of napping. I would go and go and go until I collapsed. Even having a child didn’t make much of a dent in this. I tried to nap, but didn’t know how. Instead, I drank more coffee. But when I was pregnant with my second child, and my first was a toddler? THEN I finally needed to nap. So I practiced. I learned. And I got good at it. Both kids have stopped napping, but I try to have one every day. I am certain that even this small bit of extra rest is good for my body and mind. Here are a few of the things that help me to nap. 1. Lay down at a regular time. 12:30 to 1:30 is a good ballpark. Much later and you risk interfering with night time sleep. 2. Plan a light rest, not a marathon. You and your body benefit from reaching the second stage of sleep, not deep sleep. Twenty to thirty minutes is a good amount of time. 3. Quiet your mind. Turn off the TV, radio, computer. Read a little. Loosen restrictive clothing. Here’s a technique that works for me: Close your eyes. In your head, name five sounds that you hear. Next, name five things that you feel. Open your eyes, and name five things you see. Now repeat this cycle from four, to three, to two, to one. The person who taught me this technique swore that by the time I got to one I’d be asleep. I’ve proved her wrong more than once, but not very often. This is a good meditation to slow down my monkey mind. 4. Set an alarm if you’re worried about missing something. Give yourself about thirty minutes. Resting the body and trying to quiet the mind, even if you don’t fall asleep, are beneficial. 5. Hack a nap. Drink an ounce of lukewarm coffee or tea. Lie down, try to fall asleep, and twenty to thirty minutes later you’ll wake as the caffeine hits your system. I’ve seen this called a caf-nap or nappuccino. I’ve tried it. The benefit is I wake alert and ready to go. The downside is sometimes it’s harder to drop off to sleep, and I don’t get to enjoy the coffee. 6. Practice. Napping is a skill. Sleep is important. Don’t give up. Every day at 4pm, Mary Lucia of the Current plays a “No Apologies” track. One day, it was Meatloaf’s “Two Out of Three Ain’t Bad” which I sang to my bewildered kids at the top of my lungs. I hadn’t even known I knew all the lyrics. I was reminded of this idea of no apologies when I read a piece on failure by Elizabeth (Eat Pray Love) Gilbert in the 10th anniversary edition of O magazine, which I borrowed from the library. Yes, I sometimes read O. Turns out I’m their demographic. Guess what? Not gonna apologize for it. Anyway, the piece isn’t groundbreaking or revelatory. I’m sure there’s more. I’m far from perfect. I don’t get it all done, or done well. And I’m not going to apologize. So there. Some breaking news for those who like to bask in the sun. The Environmental Working Group has released its 2010 Sunscreen Guide. The not-so-good news? Nearly all commercial sunscreens contain ingredients the EWG says to avoid, including oxybenzone and vitamin A. There are only a few dozen the EWG recommends. You can search for their recommended sunscreens, or you can plug in the name of the sunscreen you’re using for you and your kids. Warning: the latter is likely to be worrying and discouraging. All of the ones I had in the house were there. Is there cause for alarm? This piece, from the Huffington Post and with the advice of a dermatologist, says no. In spite of what alarmists may say or imply, if you’re going to be outside, properly applied sunscreen will help protect against skin cancer, so it’s better to use it than not. What’s safer than that? Staying out of the sun entirely, wearing protective clothes and headgear, or at least avoiding the peak hours. Is there cause for concern? Yes. The FDA has not established guidelines for sunscreens, so there’s not regulation on dodgy ingredients. Further, there’s almost always conflicting information on what’s a good or bad ingredient. What I did was throw away the old, badly rated sunscreens, then bought a tube each of two of the EWG’s recommended brands, Badger Unscented SPF 30 and Vanicream SPF 30. I got the Badger at my grocery co-op, and the Vanicream at Target, so neither involved a special trip. So, to sum up. No sun is safe sun in regard to skin cancer, though it is the best source of Vitamin D. Enjoy the sun in moderation. Be safe and smart about your choices. Use a safer sunscreen, and use it correctly. Reapply as needed. Stay out of the sun between 10 and 4. Wear a hat. Cover up. I started using tanning beds when I was 17. I worked in a tanning salon for 9 months when I was 20. Then I had to see a dermatologist about a patch of skin; he cut it and several others out and found they were dysplastic–possibly pre-cancerous. He told me to never use a tanning bed or lay out again. Since then I’ve had more than a dozen patches of skin removed. Usually a patch has to be cut out twice. Once for the initial test, and again for complete removal. At the risk of stating the obvious, this is unpleasant and painful. I’ve been lucky–no melanoma. Yet.